Entertainment Weekly magazine does a four page spread on Supernatural in on the eve of 4.18 The Monster at the End of This Book. "We don't live at home. We don't sleep in our own beds. Our families aren't here. Our friends aren't here. Out girlfriends aren't here," Jensen Ackles says of the Vancouver-shot series. "To do it for another five years ... I don't know if I could handle it." Wincest is mentioned as a "unique and very creepy subset of romantic fanfiction"
In the digital version of the article, Kripke talks about the introduction of the angels, and his 5 year story arc. Jensen mentions to nod to fans in and, in relation to the "they sure do complain a lot line" says "I'm a fan of the show, and I get gripey," the actor says later in his trailer. "Where is [Kripke] going with this? What is happening? Angels and demons? Come on, man!... Then I'll read the next script and it's like, 'Oh, I kinda like that'." "We don't live at home. We don't sleep in our own beds. Our families aren't here. Our friends aren't here. Our girlfriends aren't here," says Ackles. "To do it for another five years, or whatever, I don't know if I could handle it." 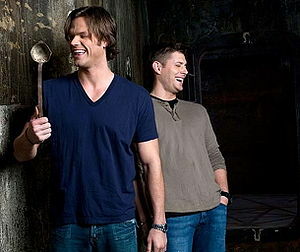 Padalecki concurs: "I enjoy working, but what's the point? Do I want to just keep on doing photo shoots and work so I can get more famous so I can do even more photo shoots and work and fly to more places to do more press?... I get sick of talking about myself." In Sept 2009, a set of fun outtakes from the photoshoot were released. 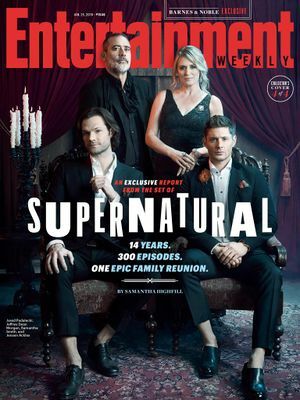 Supernatural got its first cover of the Entertainment Weekly in 2016 when the magazine had an online vote to choose the TV show that would feature on their Fall magazine cover. 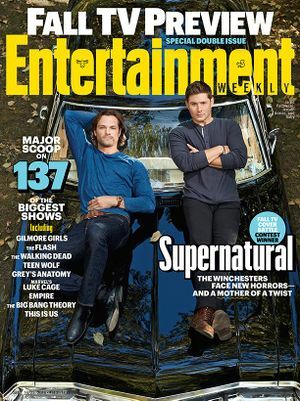 Entertainment Weekly ran a fan-voted competition to feature a show on its fall preview issue, and Supernatural beat out 63 other shows to win! Watch video of J2, Misha and Mark talking about the win. Additional pictures form the photoshoot. 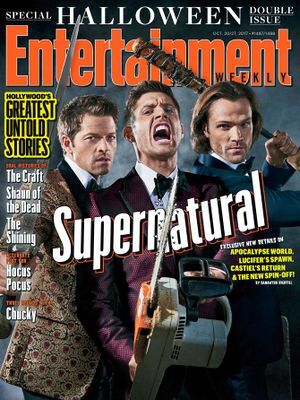 Jared, Jensen and Misha did a spooky photo-shoot which appears in the Halloween edition of Entertainment Weekly. You can watch a behind the scenes video of the photo-shoot here, as well as more news about Season 13. Entertainment Weekly published a series of interview and promo pictures and an amazing photoshoot by Eric Ogden. He's also on Instagram to celebrate the 300th episode! You can buy the Exclusive Collector's Issue featuring the Winchester family reunion cover exclusively at Barnes & Noble on 1/22 in stores or and online or via Entertainment Weekly. This page was last edited on 1 March 2019, at 04:54.